You are here: Home / Consumer Products / Crazy Shirts, Inc.
Crazy Shirts, Inc. manufactures and retails leisure apparel, including specialty dyed high quality T-shirts and shorts, generally sold in tourist destinations. Headquartered in Honolulu, Hawaii, Crazy Shirts grew from one grass shack in Waikiki in the early 1960's to a network of 44 retail stores that span the globe, a network of wholesale accounts, and its website. After expanding the concept for 40 years, Rick Ralston desired to sell Crazy Shirts by conducting a value maximizing marketing process for the business, including identifying and educating a variety of qualified financial and strategic buyers. 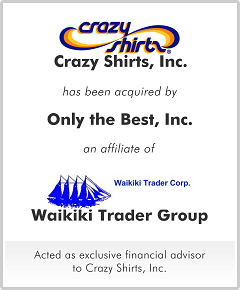 Crazy Shirts was ultimately sold through an auction process in which a local Hawaiian retailer, Waikiki Trader emerged with the highest and best bid. Crazy Shirts' owner and management was pleased that Crazy Shirt's lives on as a Hawaiian tradition.